Unemployment has fallen by 99,000 as the number of people in work tops 30 million for the first time on record. In the most upbeat job market news for some time, the Office for National Statistics said the UK unemployment rate has now fallen to 7.4%, its lowest level since early 2009. The 7.4% figure compares with 7.6% for the three months to September, and is below the rate analysts had expected. The number of people out of work fell by 99,000 to 2.39 million in the three months to October, the ONS said. Meanwhile the number of people in work was 30.09 million, an increase of 250,000 over the quarter. But 1.47 million people were in part-time jobs because they could not find full-time work, the highest total since records began in 1992. With unemployment continuing to fall, the rate is fast approaching the Bank of England's threshold level for considering a hike in interest rates. The Bank has said it won't consider raising interest rates from 0.5% until the unemployment rate falls to 7%. However, BoE governor Mark Carney has hinted that a drop to 7% won’t automatically mean a rise in borrowing rates. ‘Nearly 1 million more people are out of work than in the years before the financial crisis, and the economy remains 2.5% smaller than it was in 2008,’ he told the House of Lords earlier this week. 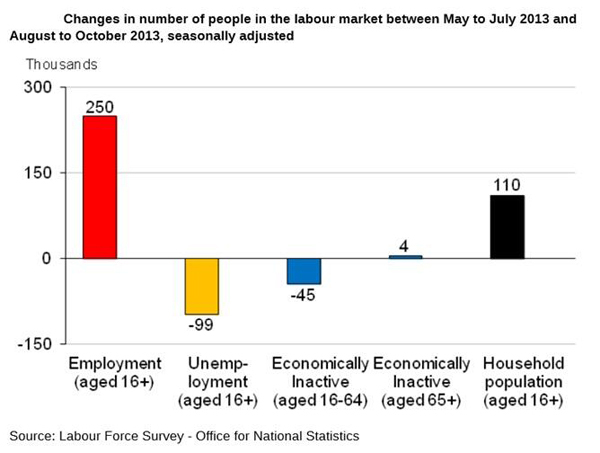 The fall in unemployment has yet to transfer to an improvement in living standards. 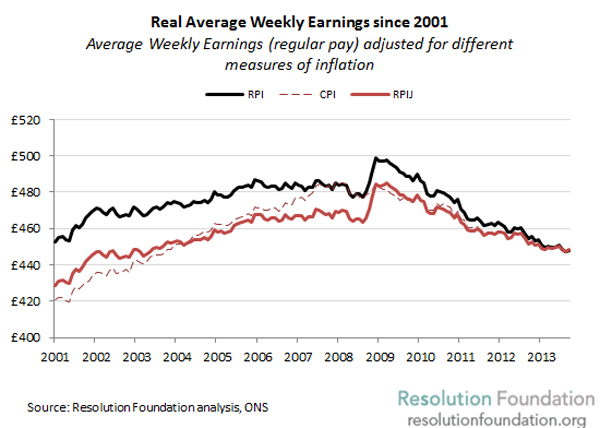 Average weekly earnings growth including bonuses rose by 0.9% in the three months to October compared with a year earlier, a slight improvement on the three months to September. Excluding bonuses, pay grew 0.8%. That compares to an inflation rate which currently stands at 2.1%. And despite the improvement in the UK jobs market, Britain is still suffering from a productivity loss that is uncertain to return even as the economy recovers from a deep recession. The amount of economic output each worker generates per hour fell sharply in the recession and has remained very weak - weaker than any other country in the G7 aside from Italy. The Office for Budget Responsibility (OBR) says that until UK productivity improves, living standards will remain flat. 'In the absence of productivity growth, you don't get the growth in real incomes and living standards that most people would think of in this context,' OBR chairman Robert Chote said earlier this month. Other data from the ONS showed the number of people claiming jobseeker's allowance fell by 36,700 in November to 1.27 million, the 13th consecutive monthly drop. Public sector employment increased slightly, by 4,000, to 5.6 million, largely because of a rise in the NHS.